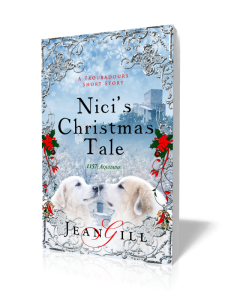 Set in the period following the Second Crusade, Jean Gill’s spellbinding romantic thrillers evoke medieval France with breathtaking accuracy. 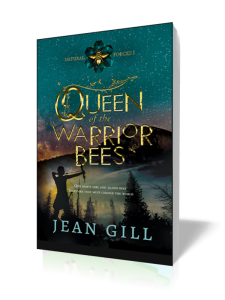 The characters leap off the page and include amazing women like Eleanor of Aquitaine and Ermengarda of Narbonne, who shaped history in battles and in bedchambers. 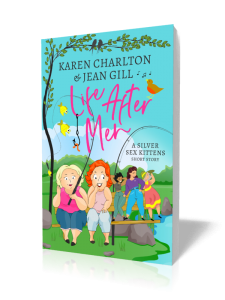 Jean Gill captures the soul of the age and the characters who lived in it. On the run from abuse, Estela wakes in a ditch with only her lute, her amazing voice, and a dagger hidden in her underskirt. Her talent finds a patron in Eleanor of Aquitaine and more than a music tutor in the Queen’s finest troubadour and Commander of the Guard, Dragonetz los Pros. Meanwhile, their enemies gather, ready to light the political and religious powder-keg of medieval Narbonne. Estela, the troubadour, is following the destiny of her beautiful voice. Dragonetz, her passionate knight, has a dangerous mission to fulfil. Divided by the times they love in, they fight to be together. Imprisoned in Damascus, Dragonetz suffers the mind games inflicted by his anonymous enemies, as he is forced to remember the traumatic events of the crusade, two years earlier. Instead of remaining safely at home, Estela is desperate to rescue Dragonetz at all costs. She sets out for the Holy Land, never realising that the person she thinks will be her knight’s saviour might actually be his doom. Can Estela get him out alive, despite Nur-ad-Din, the Muslim Atabeg; Mélisende, the Queen of Jerusalem; and an avenger from the past? Will she still want to, when she knows what they’ve done to him? The Troubadours, Estela and her lover, Dragonetz, are embroiled in two rival claims for power as their feuding liege lords gather in Provence. If the peace fails, Dragonetz’ sword will decide the winner and friends will die. Dragonetz weaves a precarious path through the rival factions at court where an uneasy truce prevails behind the chivalry of hunt and tournament. Meanwhile, Estela faces her own demons. Confronted with her childhood abusers, threatened and attacked, she confides in her friends. Tragically, one of those friends is Dragonetz’ worst enemy and Estela has no idea of what he is capable. 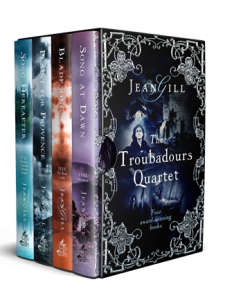 In this third volume of the Troubadours Quartet, Jean Gill, the ‘master of historical intrigue’, continues to weave the gripping adventures of Dragonetz and Estela seamlessly into real historical events. Medieval France comes alive in all its facets, from healing with leeches to training a goshawk. Dragonetz has failed Eleanor of Aquitaine once. Now that she plans to be Queen of England he could make amends. Although prepared to risk his own life on an impossible quest, a knight should protect his lady, or so say the troubadour songs. His lady, however, plays to a different tune and she wants partnership, not protection. Estela and Dragonetz fight their enemies, both on the battlefield and in the courts of Christendom, from the sophistication of Zaragossa to the wilds of Wales. Can they win through to song hereafter, together? Or have they broken one rule too many?